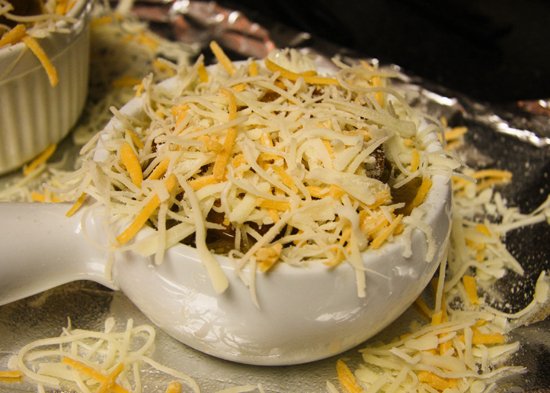 This simple recipe is a twist on the classic French Onion Soup recipe. 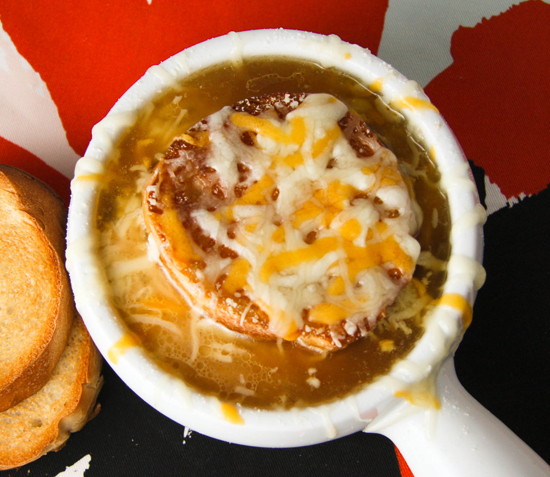 It has a rich broth filled with carmelized onions and four kinds of cheese to really bring it over the top! You will enjoy enjoy each steamy bite over a crusty piece of french bread for a filling meal. From stovetop to oven to table in just one dish! A friend recently asked me if I had any Dutch oven recipes to share on this website. I did not, so I searched for something delicious. This was my favorite of the list I pulled together. 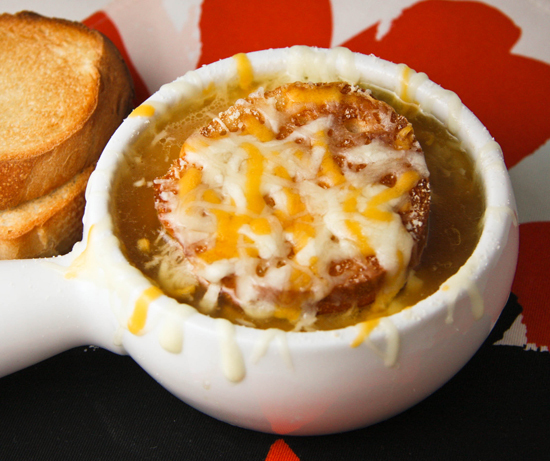 What could be more delicious than a cheesy French Onion Soup? Although I have not ordered French Onion Soup from a restaurant in ages, I have to say that this recipe was the best FOS I've had in a very long time. Perhaps even the best ever. It was DELICIOUS. Did you know that with a Dutch oven you can go from stovetop to oven to table in one dish?! 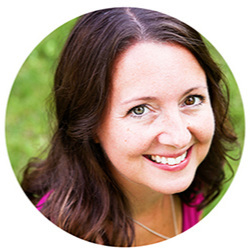 I have loved experimenting with mine. Another favorite recently has been Roasted Tomato Soup....UMM YUMM!!! There's a reason this cooking vessel has been around for hundreds of years. I'm excited to try some different recipes with my versatile little pot! Please go make this. And then invite me over. From stovetop to oven to table in just one dish! In a Dutch oven, melt butter with oil. Add the onions, salt and sugar; cook over medium heat for 15-20 minutes or until lightly browned, stirring frequently. Sprinkle flour over onion mixture; stir until blended. Gradually stir in broth and wine. Bring to a boil; cook and stir for 2 minutes. Reduce heat; cover and simmer for 30 minutes, stirring occasionally. Place bread slices on an ungreased baking sheet. Broil 3-4 inches from the heat for 3-5 minutes on each side, or until lightly browned; set aside. Combine the cheeses. Ladle soup into ovenproof bowls. Top each with a slice of toast; sprinkle with cheese mixture. Place bowls on a baking sheet. Broil for 2-3 minutes or until cheese is lightly golden.